When Maus is sick, she doesn’t feel hungry and, therefore, doesn’t eat. I eat whether I am sick or not. That is one reason why Maus is skinny and I am not 😦 Because of the above, I haven’t cooked much this week. In fact, this is the only dish I have made. Cooking for one is no fun. I first heard about this recipe about a year ago from a friend who, at the time, was going through an Ottolenghi stage. She had made it and loved it. I decided to make the recipe “some time soon”. Yesterday was the day. As luck would have it, Ottolenghi suggests serving this salad as a side dish at your Christmas table. Impeccable timing, Glenda! The recipe is from Ottolenghi, The Cookbook. Ottolenghi advises that he originally came across the recipe on epicurious.com. I Googled this recipe and then (out of mere curiosity) clicked on Images. There were a lot of images. Loads of people have made this salad and taken a photograph of it. It is, obviously, a very popular recipe and justifiably so. It tastes great. The quantities are said to serve 4 and I think that is spot on. I made half the recipe and it was enough for dinner for two with a green side salad – though Maus did only eat half of hers. Considering it is the only decent meal she has had all week, she much have liked it. 35g pecan (I substituted walnuts because I rarely have pecans in the house but always have walnuts). Cut the sweet potato (unpeeled) into 2cm cubes, spread them out on a baking tray and drizzle with the olive oil. Sprinkle with salt and pepper and mix well. Roast the sweet potatoes in your preheated oven for about 30 minutes, until just tender. Toast the pecans for 5 minutes, then chop roughly. Whisk together all the ingredients, in a small bowl, with some salt and pepper. When the sweet potatoes are ready, transfer to a large bowl. Add the spring onions, parsley, coriander, chilli, pecans and sultanas. This entry was posted in Salads, Vegetarian, What's for dinner? 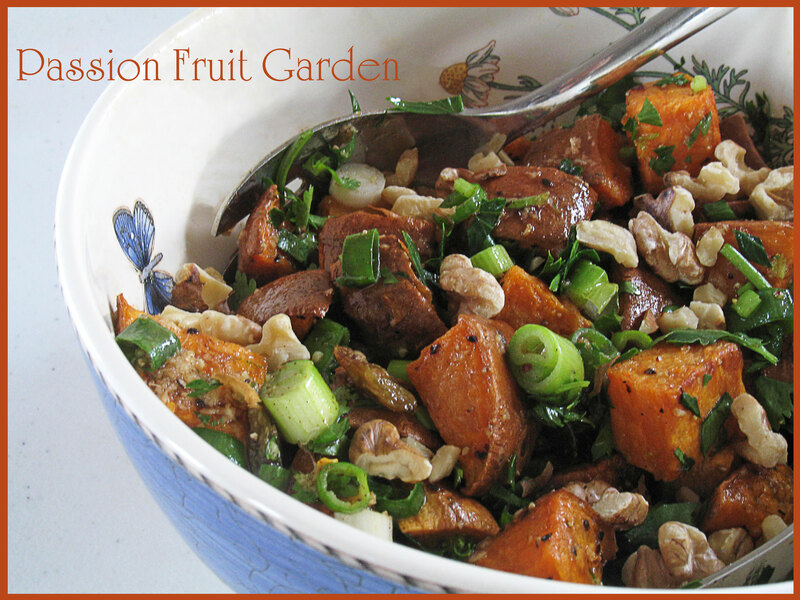 and tagged Ottolenghi, Ottolenghi Baked sweet potato salad by Glenda. Bookmark the permalink. That’s a lovely dish and so sorry to hear Maus (and you) were unwell. Is everyone back to fighting fit? I hope so. I could eat sweet potatoes every day but add maple syrup and I’d eat them twice. Hi Maureen, we are still ‘under the weather’. Oh well, I am sure there are others worse off. I eat when I am sick too Glenda. It’s hard to imagine that I would ever waste away. 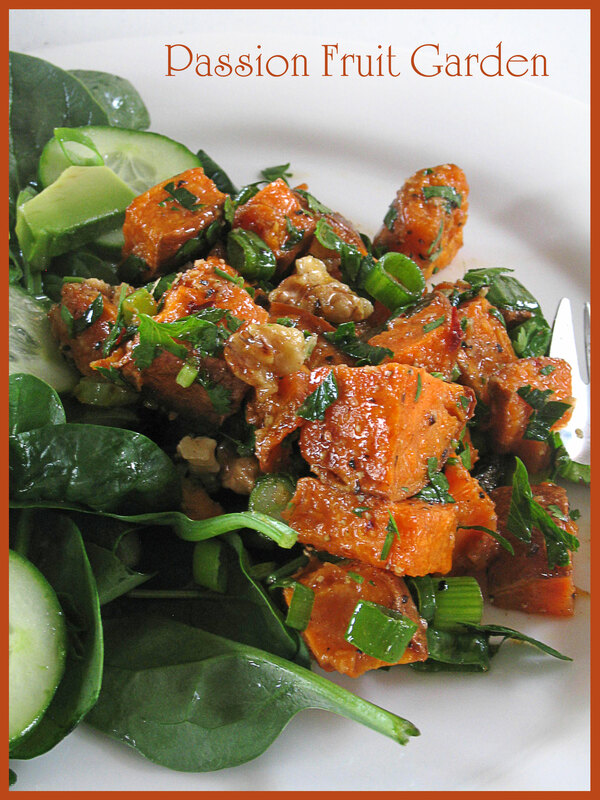 Sweet potato is a firm fave in our house and I think it pairs perfectly with fresh spinach in a salad. Hi Nancy I sure have. Having a cold in summer doesn’t seem right somehow. It is supposed to be a winter thing. Yum. Sweet potatoes are a favorite in our house. As are potato salads and anything with dried fruits & nuts. I can see why this is a popular dish. Best wishes for a speedy recovery to you both. It’s even more horrible being crook during summer and the lead up to the festive season. Ella, you are so right. Colds should be restricted to the winter months. Perfect. I have been thinking about vegetable salad dishes for ‘the day’ and this is the one. I like the way you have added some baby spiniach leaves- I think this gives a bit more body to the dish. And walnuts are better for me too- not a big fan of the pecan. Hope you both get better soon.